We always look forward to our summer break in France. Thus far it has never been a ‘dull’ or predictable experience. If surprises can be considered predictable, in the sense that there seems to be a pattern of surprises on the menu then such (surprises) can be considered the constant of our French experience. I am not referring to workers striking/protesting, a few extremely hot days, the overabundance of melon and jambon as a starter in most restaurants in summer, the almost lethargic pace of life in the Gers or spotting the English piling their shopping carts with wine (far cheaper than in Britain) and perhaps getting drunk out of sight. I am referring to the kind of surprise one would never expect! Our surprise this year (I think the most unexpected thus far) is to arrive at the place we call home in France to find bees busy, organised and industrious working on a hive between one of our windows (with the best view) and the wooden shutter. At first a scary sight but now a delightful fixture as through the glass we can observe their work, play and rest habits! 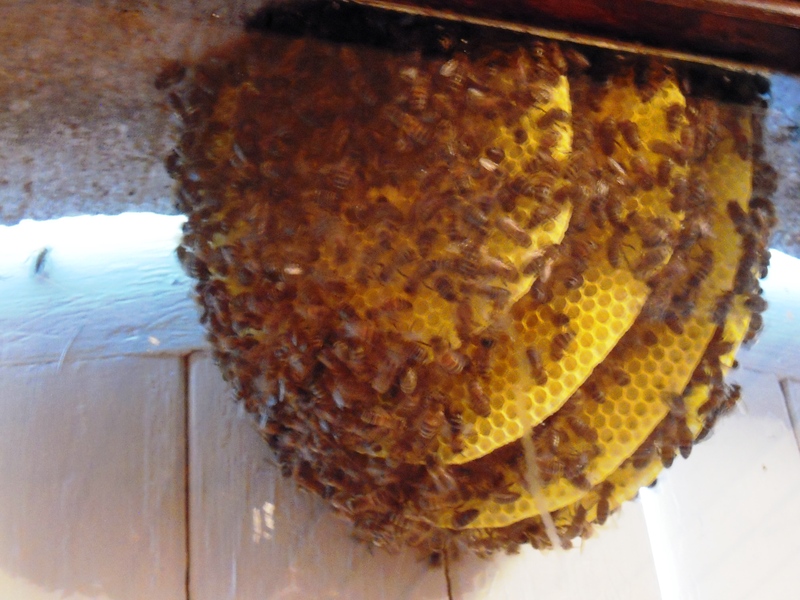 It is a young hive and overnight we were amazed to find another comb built! This can prove to be the envy of any natural museum! Our local farmer and friend has advised us that the Queen in this hive having being displaced by the Queen in the other hive between our thick stonewall decided to migrate to this spot and some of the faithful decided to follow her. He quite correctly noted that the Bees in the region are endangered as a result of the use of pesticide and that we should try to protect these. One of his older friends, who is a bee keeper, will be coming to “recuperate” our surprise of a hive. I must say that we are caught between wanting to leave the bees alone, having seen the work they have done thus far, and being protective of this sweet place we call home. We are caught between a glass window/view and a bee hive! In the meantime, as we await for the farmer to turn up, perhaps not with the same sort work ethic of this colony of bees, we can be assured that for certain this is going to be a memorable and sweet summer and no bee will be on strike! There must be a parable or sermon somewhere in this surprise!